Get in touch with nature at Gullfoss and Icelandic HorseWorld. Spend the 7th (Fri) exploring the striking scenery along Golden Circle Route. To see reviews, ratings, other places to visit, and more tourist information, refer to the Geysir trip itinerary planner. Montreal, Canada to Geysir is an approximately 17-hour flight. You'll lose 5 hours traveling from Montreal to Geysir due to the time zone difference. Expect cooler weather when traveling from Montreal in July: highs in Geysir hover around 14°C, while lows dip to 11°C. Finish up your sightseeing early on the 9th (Sun) so you can go by car to Vik. Get outdoors at Laugavegur and Seljalandsfoss. 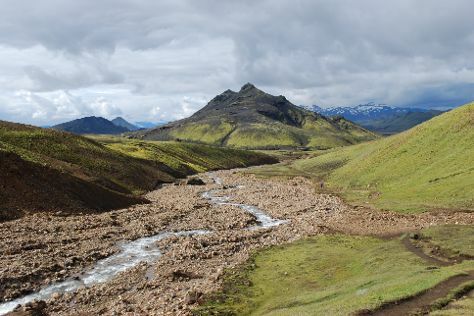 Step out of Vik to go to Kirkjubaejarklaustur and see Fjadrargljufur Canyon, which is approximately 1:10 hours away. The adventure continues: enjoy the sand and surf at Black Sand Beach, pause for some photo ops at Voyages Friendship Statue, explore the striking landscape at Sólheimajökulll, and take in the dramatic scenery at Skogafoss. For ratings, more things to do, traveler tips, and more tourist information, use the Vik sightseeing planner. Getting from Geysir to Vik by car takes about 2.5 hours. Other options: take a bus. Cap off your sightseeing on the 12th (Wed) early enough to go by car to Hofn. Höfn or Höfn í Hornafirði is an Icelandic fishing town in the southeastern part of the country. On the 12th (Wed), explore the wealth of natural beauty at Vatnajokull National Park Visitor Center and then see the interesting displays at Huldusteinn. Get ready for a full day of sightseeing on the next day: contemplate the waterfront views at Jokulsarlon Lagoon and then make a splash at Hofn Swimming Pool. To find ratings, maps, photos, and more tourist information, read our Hofn vacation planner. You can drive from Vik to Hofn in 3.5 hours. Alternatively, you can take a bus. July in Hofn sees daily highs of 15°C and lows of 10°C at night. Cap off your sightseeing on the 14th (Fri) early enough to travel to Reykjavik. Take a break from the city and head to Thingvellir National Park and Askja. Go for a jaunt from Reykjavik to Grindavik to see Spas & Wellness about 44 minutes away. The adventure continues: take in the architecture and atmosphere at Hallgrimskirkja, take an unforgettable tour with a helicopter tour, surround yourself with nature on a nature and wildlife tour, and make a trip to The Pearl (Perlan). To find more things to do, where to stay, and other tourist information, go to the Reykjavik online itinerary creator. You can do a combination of bus and flight from Hofn to Reykjavik in 5.5 hours. Alternatively, you can drive; or take a bus. In July, daily temperatures in Reykjavik can reach 17°C, while at night they dip to 11°C. On the 19th (Wed), wrap the sightseeing up by early afternoon so you can travel back home.